Teak removed in '16-now no maintenance fiberglass! 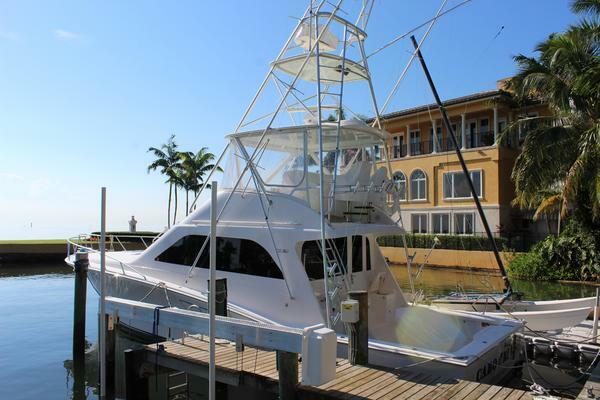 As the listing broker I have a source with conventional marine financing available. Please contact me for details. Thank you! After you review the long list of upgrades your first question is probably "why would the boat owner invest $50,000- plus and then put the boat on the market"? The answer is two-fold and simple. The first fact is they are extremely proud of their boat and have done everything in their power to maintain her to the highest standards and upgrade her in every area they could think of. Second is they are ready for a larger Hatteras Convertible. 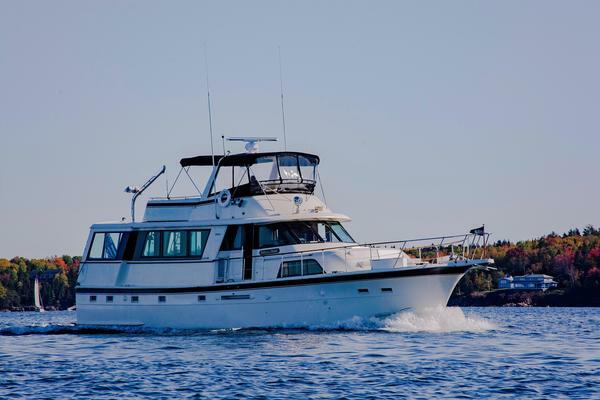 If you own a 55' Hatteras CV and will consider Cannonball as a trade please contact the listing broker. There is an insurance survey from 2016 available upon request. Two items to note to any prospective buyer. When the new Sea Star steering was installed in '17 the lower helm was not hooked up. The boat owner never uses the lower helm and did not hook up the new system. The boat had a lightning strike in 2014 which damaged the bridge electronics. The bridge electronics have all been replaced and there are no other issues from the strike. This boat has no smells. She looks, feels and acts like a much newer boat. Fuel tanks have no issues or problems and the entire electrical system operates as it should. Any buyer can be comfortable buying this boat today and fishing the stream or even heading for the islands. She is ready for her next adventure! The master stateroom is located across from the galley to starboard. It features a double bed with private access to the head and shower. The forward guest stateroom features V shaped bunks that are surprisingly large and comfortable. There is a sink in the stateroom and a seat for dressing. Wallpaper is new from 2013. A large deck hatch provides natural light and ventilation. As noted prior the engine injectors were cleaned and valves re-set in 2016. The engines and engine room were painted in 2016. This boat does not look, feel or act like a 1979 model. The bridge on this boat is spacious with seating for 10 adults. The aft helm is ideal for fishing and when backing into your slip. The helm seats were new in 2014. There is a bench seat on he port side of the bridge and forward of the helm console. Bridge seats were replaced in 2012. Electronics were replaced in 2014. Exterior teak was removed and glassed over in 2016. The boat looks great and maintenance was greatly reduced. Spacious cockpit is great for fishing and entertaining. Entire boat was awlgrip painted in 2012. Davit has a 1200 pound capacity and works great. 11' Boston Whaler dinghy and motor are not included with the sale. The boat owner will entertain an offer on the Whaler and motor separate from the sale of the Hatteras from the a buyer of the Hatteras.